I’m not the only one petrified to fly. Anxiety runs in my family. My aunt once leapt from her seat to stand near the closing door to the plane cabin, so she could take what felt like her last breaths. “Mam, we need you to take your seat NOW.’ ‘I know, I know, I just need to breathe.’ When she got to the Mexican resort she was staying at she spent just one night–the stress of being there, in that new place, completely maxed out her nervous system. I’ve got so many stress buster tools up my sleeve that if they were cards I could beat Vegas magician David Copperfield in a card-pull competition, no problemo. Do they work? You betcha. The fact that I can even get on the damn plane is testament to their impact. On the way home from New York a couple days ago, I got mad. I was tired of feeling afraid. I didn’t want to spend five and a half hours with adrenaline and cortisol carving away at my nervous system. If other people could be calm, so could I. For the first time on a flight, I recognized and reined in my inner lizard. Beneath all of her high-drama rantings–“OMG, do you hear that buzzing sound? Something is wrong with the engine. We are going to DIE! The plane is going to CRASH! I can FEEL IT FALLING!”–is one simple intention: to keep me safe. She thinks that the more she worries and freaks out about something, the better I’ll prepare for the outcome and that this will help me a ton. Even if the outcome is imaginary. Even if according to pilots statistically speaking, it’s less likely to happen than getting hit by lightening. She really, truly thinks that worry and fear is helpful. We went back and forth like this for at least the first 45 minutes of the flight until, finally, unexpectedly, Liz went quiet. The plane jiggled. The engine buzzed. There was even a small drop or two. I breathed in, I breathed out. So did Liz. It was working! I had done it! I was developing new neural pathways! Freeing myself from patterns of thinking that didn’t serve me, calming my nervous system and settling in for a well-deserved nap. Ah well, that’s why they call it a practice. I’ll give it another go on my next flight. p.s. 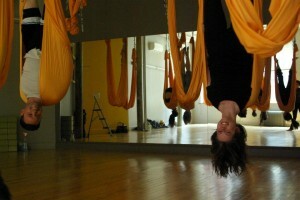 the pic was taken at the newly-opened Om Factory Flight Centre in NYC. In New York, you’re in such a hurry that you step on the heels of the person in front of you, who steps on the heels of the person in front of her, who pushes his way through a mess of snarling honking traffic so he can keep going going going. Going. Everyone is going somewhere. Nobody is coming. But some are arriving—and lots hope to. One day, when their dreams come true. There are so many smells in New York you need to remind yourself you’re not in a toilet or a garbage bin or a hot dog stand. You are in New York. Where dreams are made true. Buildings that’ll break your neck, apartments that will break your bank, and glossy-haired men and women who will break your heart. There is heart in New York; it’s tucked away. It’s in the third and fourth floor yoga studios, where scarf-wearing, hemp-toting hippies extend om-tattooed arms around perfectly coiffed, organic cotton-wearing metros who sport discreet, viciously expensive diamonds. It’s in Central Park, where tourists from all nations smile the same smile of delight as they stream down pathways on rented bikes—locals glare at their impudence, while secretly harboring pride that they know bikes aren’t allowed on the paths. The locals know the paths, and they know the spots: the rock that gets the most 2 pm sun, the tree canopy to lean beneath when it begins to rain. There is garbage everywhere. Piles of it one on top of the other in pyramids of stench. That’s the thing about New York—it’s all on display. Less people hide. And people hide less. Pyjamas while walking the dog. Cigarettes and coffee on the step in the morning—hair matted together by last night’s hairspray. Kids in the street. Crap on the sidewalk. Don’t smile unless you mean it—they don’t. And they don’t expect you to. The energy. Everyone talks about the energy. It’s a “thriving metropolis,” the “definition of a great city,” a place where no matter what time, no matter where, there is always something going on. “The city that never sleeps.” There is peace, but never silence. Calm, but always with a sense of impending storm. Take an Ambian. You need the rest. More. More. More. Fifth Avenue. Park Avenue. Bakeries, chocolate-makers, coffee artisans, designer clothes, fresh-pressed juices, wheat grass, vegan delicacies, Greek, Italian, Indian, Puerto Rican. Pizza in Brooklyn. Greenwich Village. The East Village. SoHo, NoHo and Nolita. Chelsea. There is always more here. And you will want it. You will fall in love with the constant rising of the city. The only downturn is when you trip, exhausted, and fall. New York never falls, though people fall in love with it. In New York, it’s good to be in love. The love bubble gets dented and bashed while you’re running through the biggest mass of the loudest people you’ve ever seen in Times Square. It gets bumped up against while you’re clutching your bags, purses and Whole Foods groceries to you on the M-train to Brooklyn. It gets pricked by the pain of seeing limping, aching, shrinking homeless people’s bruises and empty hands. But, it’s good to be in love in New York because at the end of the day you can fall into each other’s arms and feel serenity again. You summed up NY so well! I lived there for many years and now you’ve got me missing it. I’m also someone who never rests on a plane. Who else will keep the wings up? So I enjoyed the comraderie here. Loved what you wrote about doing yoga on an airplane and in the airport! I’m so doing this the next time I have a flight.